London is fortunate to have large green spaces. More than most cities of comparable size. Boris Johnson, London's current mayor, wants it to be greener. During his election campaign he pledged 10,000 more trees would be planted if he was elected. 1,500 of those have been planted in recent weeks. If only he could improve the tubes. Beautiful!! It's SNOWING here in Iwate T_T I want blossoms, too!!! Planting, It's really a good activity. Trees make environment to be purer. What a lovely sight! Green leaves and fruit trees in bloom! I can't wait for the trees to just start to bud here and for the last of the dirty snow to melt away so the city can start it's spring clean up! On another note, the pink car is very nice touch to go with the blossoms. Good decision , trees in town are important ! Good shot ! I love the pink blossoms and the pink car! I love the idea of lots of green spaces! Wow. 10,000 trees! Seems like a massive undertaking. Do you think they can do it? 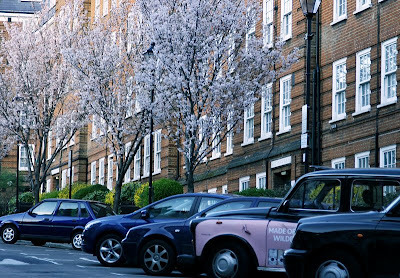 Those beautiful pink blossoms go well with the pink-sided black cab. We have a lot of yellow blossoms right now on the palo verde tree. I'll have to get a few photos to post. Probably easier and cheaper to plant trees than work on the tubes! It's funny that Londoners complain about the tube, because in America, we're still (sadly, pathetically, etc.) trying to catch up to Europe in the public transportation sector. Some of our big cities have pretty decent mass transit, but for the most part, we are forced to drive ourselves around, wasting gas and further growing the hole in the ozone layer. Giant Sigh! So beautiful. I love Spring. So beautiful. Just hope that the bad and colder weather expected at the weekend won't freeze them all. Or maybe London will be spared. Ciao. A.
I agree with you. They should definitely plant more trees in the tube. Pretty. Thats one of the great things about London - lots of green. Good old Boris!! And I agree with JM. Let's make an exception for these cars. I do hope they plan carefully before planting those thousands of trees so they'd be able to live and thrive wherever they're planted. Yes, I agree. It is fine to have an aim of 10,000 but the placement has to look into the future. Boris will get there. We have a Lord Mayor named Clover and she started a bit rockily but is managing her "village" very well now 8 years down the track. I love spring pix. We're heading into Autumn here in SA. Well, at least the new trees will be nice to look at when you come out of the tube! What a pretty picture - all the colors just work so well together. I've heard about Chicago's idea of increasing greenery by putting parks on city building rooftops. Beautiful! I so love blossoms - the gorgeous smell it brings and of course, the promise of spring!